But after the real estate boom turned to bust, most of those options slipped away, leaving scores of foreclosures in their wake, while making lenders think twice about lending so loosely in the future. However, there are still a few programs out there that offer 100% financing, sort of…of course, these loan programs aren’t available to everyone, so in reality, you’re probably going to have to put some money down if you want that shiny new house. One of the few remaining zero down loan programs comes from the United States Department of Agriculture (USDA). While it is reserved primarily for low-income individuals and households, you can have an income up to 115% of the median for the area. In other words, it’s easy to get approved for a zero down mortgage from the USDA, assuming the property is located in a rural area, or at least an exurb. The loans are typically 30-year fixed mortgages, and private mortgage insurance can be avoided thanks to a guarantee fee (which can also be financed). Contact a loan officer or mortgage broker for more information on the program. Government mortgage financier Fannie Mae also has a program called HomePath® that offers financing with down payments as low as 3%. The kicker is that the down payment can be funded by your own savings; a gift; a grant; or a loan from a nonprofit organization, state or local government, or employer. 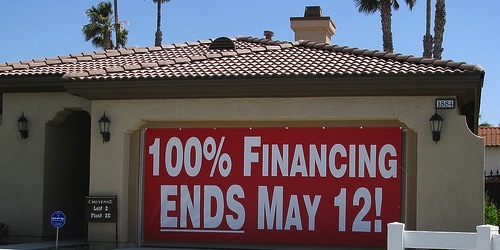 In other words, zero down financing…and you can avoid paying mortgage insurance. Government-owned Freddie Mac also offers its Home Possible® Mortgage, which requires as little as 3% for down payment, with no required borrower contribution. However, the borrower’s annual income cannot exceed 100% of the area median income, and if any borrower is a first-time homebuyer, they must complete a homeownership education course. Secondary financing is even available behind the Home Possible Mortgage, and qualifying is much easier than with traditional mortgages. It used to be possible to get an FHA loan with zero down thanks to seller-paid downpayment assistance, but now you need to put down 3.5%. However, you need a 580 credit score to qualify for the flagship low-down payment program. Those with credit scores below 580 must come up with 10% down, making it relatively unattractive to take out an FHA loan. You also have to pay both an upfront mortgage insurance premium and an annual mortgage insurance premium, which could get expensive in a hurry. While it’s not 100% financing, it’s pretty close and not a bad deal for those with marginal credit, considering most conventional lenders these days want 10% down and a great credit score to boot. So there it is – if you take the time to shop around you may be able to get that property you have your eyes on without breaking the bank. Some credit unions will allow you to purchase a home with as little as 5% down, while the larger banks and mortgage lenders want 10% these days. But perhaps the best way to see all your options with regard to down payment is by getting in touch with a broker, who can shop your loan scenario with various lenders and explore their numerous programs. Tip: Make sure you’ve got seasoned asset reserves in the bank to cover several months of mortgage payments and closing costs to ensure there aren’t any hiccups in the loan process.